As I was updating the blog with information about the previous sink building session, I had a thought. I had stopped last time after mounting the long front and back sides, figuring I could put the two end pieces on quickly, perhaps even waiting until after it was hooked up. But attaching the end piece toward the corner of the room might become more difficult when it gets hooked up to the plumbing, and it may not be so easy to move the whole structure around the room. So when I was finished with my Studio work today, I called Mary to see if she was able to let me knock out the last step this afternoon. She was, so once I was able to find parking (summer seems to be here now, so beach towns are full of problems) I got to her space and got to work. Luckily today's task wouldn't require as many tools, as I had to carry things from a few blocks away. The plan was simple. Take one of the 6 foot boards, cut two 33 inch pieces, and connect the front and back sides, making a frame. Drill holes, drive screws. The right angle clamp (above) wasn't for measuring purposes, but more just to help hold one end in place while I was drilling the other end. From start to finish today was less than an hour. So far Mary is very satisfied with the results. 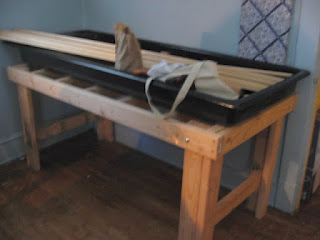 The black plastic sink basin isn't mounted, just resting on the joists in the frame, but it is pretty much contained, with only a little bit of each plastic end overhanging, all part of the plan. That last board sitting in the sink will eventually be used to make a piece of flat counter that can sit over the top, but that will wait until the rest is done. And at this point, there is nothing else I can do until the plumbing is hooked up. She's hoping to get that done sometime next month. Meanwhile, she can organize the rest of the space in anticipation of her new studio. What to do with a Saturday off from work? Had no deadlines to deal with, but I do have some blocks in progress so I had something to work on. Still just sketching, and I could have done that at home, but the Studio is actually more comfortable on days like this, with the coolness of that basement, and the humidity of the summer not yet arrived. So in the afternoon I took a ride up there, put on some music, and did just a little more sketching. This included some more details (turning some of the background into specified shapes of romaine lettuce, etc) and roughing in some more value sections (taking cues from the first print in this series, also set in the produce section of the same chain, but more than 40 years earlier). I'll probably sit on it for a few days, but if I don't come up with any other ideas, it's probably time to start cutting this thing. A rare day this week that I wasn't scheduled to be anywhere for work, so I contacted Mary and (with her permission) scheduled myself to do some more work on my sink project. The process is nearing the end, so I'm getting excited to finish it. The next step was to make the diagonal braces that will stabilize the four corners. 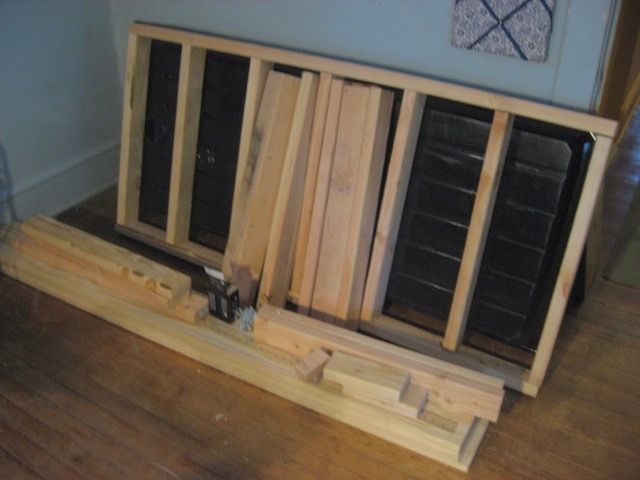 Simple enough- take some 2x4 pieces I had left over, cut each into two with a mitre saw, so each piece had a 45 degree angle on one end, use a C-clamp to hold the square end up and behind the frame, then drill a hole through the frame to attach it with a carriage bolt, then switch to a smaller bit and drill a hole for a long wood screw to attach the mitred end to the leg. Repeat 3 more times to get all four legs. See above and below. Each end has one two-legged leg unit, which can be detached by removing six nuts and extracting the 6 carriage bolts. putting it back together would be just as simple. A bit trickier was attaching the sides. 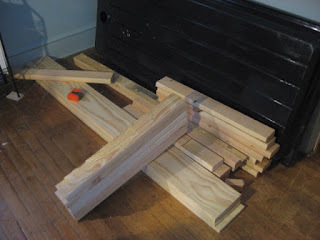 I had bought some 1x8 pine boards, with the plan to build a simple frame that would surround the sink basin. Simple in concept, but holding up the 6 foot board while I secured it in place was a little difficult. 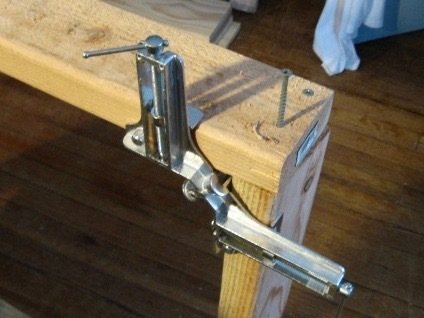 In the end I used a combination of 3 clamps- the wood bodied hand screw and two C-clamps, adjusting and shifting, checking with my level, until I got it where I wanted it, then attached it to the 2x4 frame. The wood screws I had were longer than the combined width of the exterior board and the frame, so I lined the screws up to go through the board, the frame, and into the joists that will hold up the sink. Did the two long sides today, the second one going slightly faster as Mary had come upstairs and I could put her hands to use before I had all the clamps in place. Around 5 pm I decided to call it a day. The only thing I have left at this point is to cut one of those 1x8 boards down to make the two ends, which will complete the exterior frame. Can't really do more than that until I learn what the plumbers will be doing. I purposely designed this thing with lots of open space underneath, leaving plenty of options for where the fresh water can come in, and where the old water can drain out. The last time I had been working on my block drawing in the Studio a slightly disturbing thought crossed my mind. Having gone to great lengths to make use of historical facts and images in this piece, was my use of pineapples as a substitute for severed heads even plausible? Sure, pineapples are available in Europe now, but were they in 1066? Later when I got home I looked up the history of the fruit, and it turns out they came to Europe for the first time courtesy of Columbus. So they had to go. On one of my many supermarket visits I looked at what other items worked visually and made notes. Watermelons seemed the best option. Also a large oblong shape, easily recognizable. It originated in Africa, so an old world fruit, and my research turned up that they had been imported into Europe by the Moors by the 10th century. My summer job often includes long stretches with not much to do, and rather than just sitting around texting people, I'd rather bring art to work on. This past weekend I did that, and used the time to replace the pineapples with watermelons. After four consecutive days of working, I was off again today, and took advantage of the opportunity to get back into the Studio. At the last critique a few people said they felt there was too much white space in the drawing, especially in the lower half. In the image above, it's all white space that will be the floor. Traditionally I show the edges of tiles in these prints, so those lines are part of the spaces. Many of the designs ended up including patterns of dark (black) tiles, sections of value that can help balance the composition. I had all the original blocks for this series there in the Studio, so I pulled them out to see the kinds of patterns I had used for the floors in the past, and added those to the new design. Added some random values to the triangular pennants hanging across the store, and tilted the head of the man at the far left back, a reaction to the beets (the comet) about to hit him in the face. The results are below. I need to clean up the perspective a bit, and add some details here and there, but I think this one is mostly done. I'll look at it again in a few days and see if anything stands out as needing change, but right now I think I am just about done. My calendar tells me that I will be busy for a lot of days over the next week. Today would be an exception, so I set up today as a day to continue the sink project. Last session I had made the horizontal frame and made legs to go in the corners, but left assembly for the next time. That time was today. As a general rule I prefer to build tables on top of other tables, or at about waist height. The first table I built (my work table) was on top of a desk that had been left in the Studio. The other two Studio work tables were put together on top of my work table. Working on Molly's Table Talk project, I moved two large plastic folding tables into the studio space and did most of the work on top of those. Much better than crawling around on the floor. 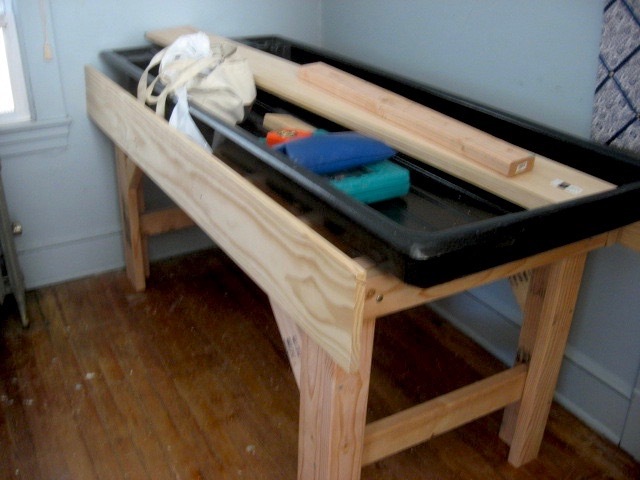 I knew that Mary had a folding table as her miter saw had been set up on it on her porch when we did that a few weeks ago, so I asked to borrow it and carried it up stairs to the studio space. Took my legs from last week, positioned them, and measured the space between them on each end, so I could cut a horizontal piece to stabilize them. 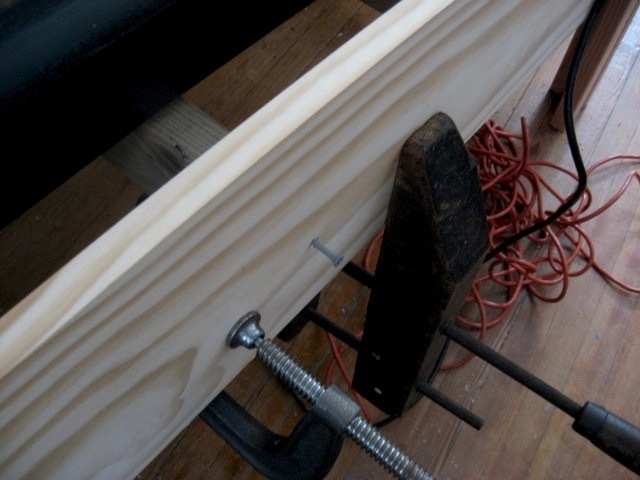 Used a C-clamp to secure one to the inner corner of the frame and drilled a 1/4 inch hole for the carriage bolt. One little problem- I had miscalculated the size and the bolts I had bought were about an inch too short. Only solution was to go buy more. Mary knew that there was a suitable hardware store close by, just a few blocks away, across from the train station. If it was just me I would have walked, but she came along to look for other stuff and so she drove us. Walked in the door, and a soon as my eye adjusted to the low light, I spotted the wall of hardware. Grabbed a dozen of the correct size bolts and matching nuts, met Mary at the register (buying something for herself), and in a few minutes we were back at her house. 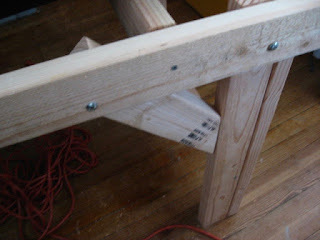 One at a time I clamped a leg to each corner, verified the levels, and then drilled a hole on each side. With the legs loosely in place, I measured and cut the horizontal stabilizer, attached by long wood screws though the legs and into each end. I tightened all the bolts, organized my stuff, and flipped it off the table and onto its four legs. So far so good. We moved it into the corner it will eventually occupy, and stuck all the rest of the supplies in the sink on top to get them out of the way. Mary was impressed so far, both with how sturdy it seems and all my cool tools. Two more main steps. 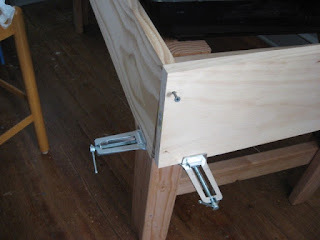 I'm going to add angled supports connecting each leg to the frame, and then use 1" thick boards to build the frame that the basin will sit inside. Those items will have to wait another week or so. Meanwhile, her space is starting to come together more. 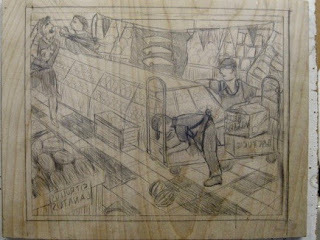 I got to the Studio extra early tonight, so I could do some more work to my new block drawing before the scheduled critique. As always, wasn't sure exactly who would be coming. Had heard from three people, two positive and one negative, but anything can happen. Just before 7:00 I was still the only person there. With the school year nearly over, the building was mostly empty (no dance class kids, no plays being rehearsed), so some footsteps in the basement hall were easy to hear. Turned out to be Vince, one of our oldest established regulars, and one who comes a great distance, but one we haven't seen around lately, so it was a pleasant surprise. Moments later Molly came in, followed by Tim who we had heard moved away (false we learned). Molly wanted to move to the cafeteria, and as we were doing that, Mary and her daughter Katie arrived, then Margery and Sheilagh. That brought us up to 8, 7 with art, a very respectable number for a summer Monday. Above, clockwise from the upper left corner, a collaborative piece with contributions from Tim, Molly, and Sheilagh, woodcuts from Mary, a painting from Tim, my woodblock, and a mixed media piece from Katie. 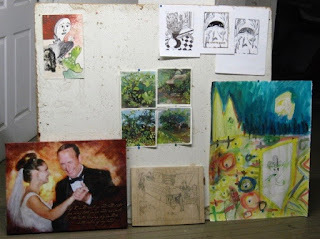 In the center, paintings from Molly. Below, on the floor, some shadow puppet pieces from Molly, part of a presentation she will be doing elsewhere tomorrow. Above, two new clay figurines from Margery, and a mixed media painting from Sheilagh, done as a book cover for a friend. There was another volunteer for the collaborative piece, so it's not done yet. As for my piece, generally people liked it. A few people suggested there should be some way for viewers to know more about what inspired the piece and story behind all the elements in the scene. Although I don't keep that stuff secret from anyone who wants to know, I don't post it by the piece either. 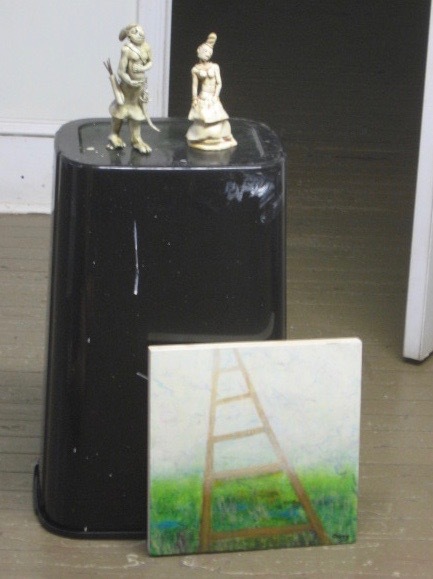 I prefer to let viewers engage with the work in their own way, and use their imaginations to figure it out. Anyway, it was another fun night. Today is the first Monday of the month, and thus critique day. Seemed a good occasion to advance the current project just a little further before I would present it tonight. 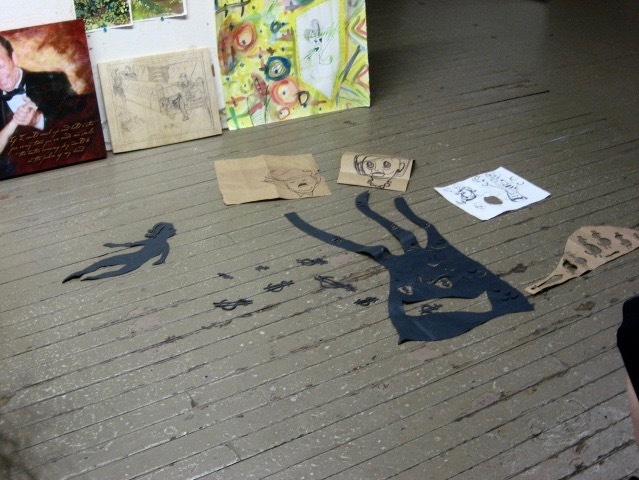 So I got up to the Studio about 5:15 and took advantage of the space and relatively cool conditions in the basement. Mostly minor changes made today. Biggest new thing was adding some flags and a banner hanging across the store, one of which is the 6th century English flag with the swords. Filled in a few values, just to see how it would balance out. Just as yesterday, a lack of other commitments for today meant that I could get back to a long term task. Yesterday it was a woodcut. Today it was a construction project. 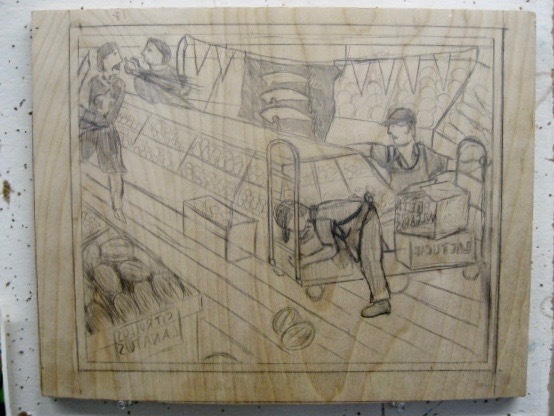 A few days ago Mary told me that this would be a good day to continue this sink project, and like the woodblock, the lack of reported activity didn't mean it wasn't being worked on. When I completed the cutting of all the 2x4's I realized I was going to be short one leg from my plan. Since all my employment preparations had me driving back and forth through Neptune for weeks, on one trip when I was not far from the lumber source I dropped in and picked up one more 2x4. Tried calling Mary, but she wasn't home, so I stashed it in my Studio. 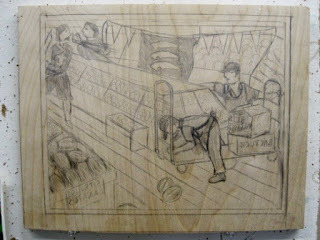 Knowing that I'd be working on this today, while I was there yesterday working on my block drawing, I stuck the wood in my car. All the tools I'd need were either in my backpack or already in my car. Since the sawing, Mary had gotten someone to help her move the wood upstairs to her studio space, and since the last time I was there, she had the bed in that room removed, to make room for the new sink set up. I brought in the new 2x4, and my various tools, plus my construction plan, and got to work. Not a huge space to work in, but I'm used to tight spaces. 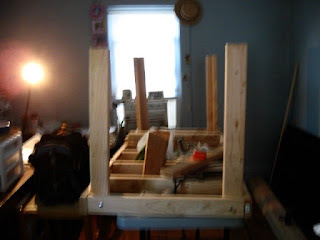 I have no photos from those days, but when I was building all the tables and shelves for the Studio, I had to work around many large pieces of furniture that Molly had given to her for her new home, but was not ready to move in yet. One of the things I brought with me today was my right angle clamp. 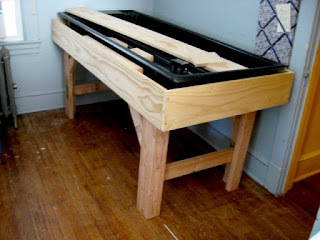 A tool acquired for the purpose of assembling miter cut frames, it had also been useful making all those tables a few years ago. Moved it from the Studio to my car a few weeks ago, figuring it would be helpful here as well. The plan for today was to just start making it, an keep going until we ran out of time or it was finished. I knew she had plans around 5 pm, so I wasn't expecting to finish it today. Started with the main frame, which includes joists that will eventually support the sink. It is also the thing everything else will attach to. 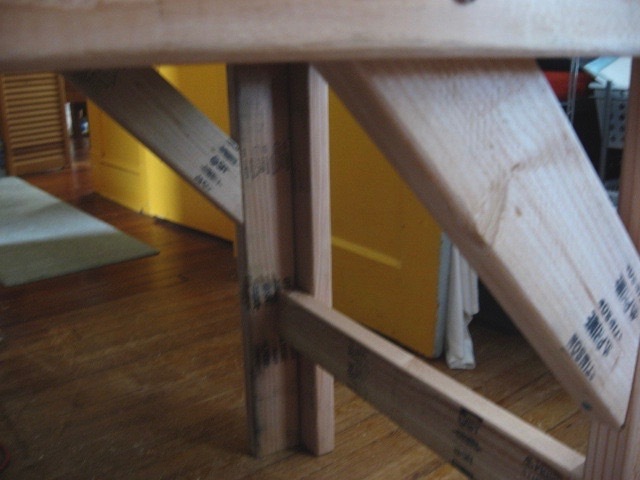 Then I assembled the four main corner legs. The next step would be to start the assembly process for the whole structure, but there wouldn't be time to get that done today, so I organized the parts, straightened up, and packed my car. I'll give her a call next week and we'll pick a day to have me come back and finish it. I figure one more session should get it built. 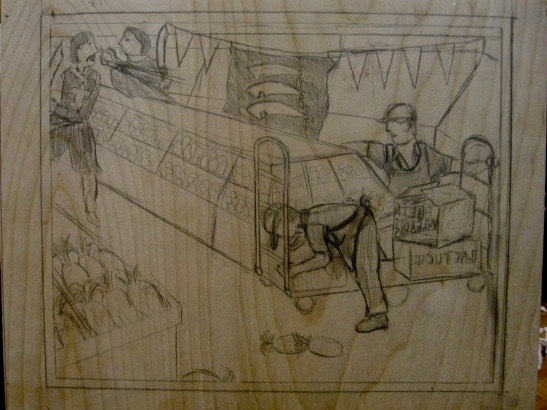 It's been about a month since I last worked on the most recent supermarket print, but a lot has happened in that month. Most of my time was occupied in getting and starting a new job, which involved a series of interviews and a ton of paperwork. (physicals, fingerprints, etc) Been to a few trainings (paid) and have a bunch more to come. And had my first shift last weekend. And while not part of this new job, I also earned money this week editing a newsletter and mowing the lawn, and tomorrow I go back to my building project, and then I'm busy all weekend. But today I had nothing I had to do, no places I had to be. So time to work on some art. I had not done much to the block since the last posting about it, but I have spent a lot of time thinking about it, and had done a bit of research. For example, last time I mentioned that I liked the two figures with battle axes in the upper left corner, but it didn't make much sense for store employees to have battle axes. The supermarket where the inspiration occurred (and where I still regularly shop) has a large meat department window, allowing shoppers to see the butchers at work. Perhaps they had something I could incorporate. So I walked over there, carrying something to sketch on, hoping to see something I could use in my composition, only to find the store had parked a giant display case in front of that window, as part of their redecoration. No more butchers. I remembered from my opening day trip to the new Whole Foods that they also had a large window showing off their meat department in action, so on another day I walked over there. The guy at work did not have a battle axe, or even a cleaver, but he was using a large meat cutting knife, a slightly curved blade, kind of like a sword. Another thing I was researching was possibilities of the flags, symbols representing the two nations in my story. Unfortunately, neither nation actually existed at the time of the Battle of Hastings. And the traditional flag of England (red cross on white, their contribution to the Union Jack of Great Britain) was still a few hundred years away from existence. However, I did find a flag linked to a specific city or region that had existed since the 6th century, featuring three short swords with curving blades. See how all these things start coming together? 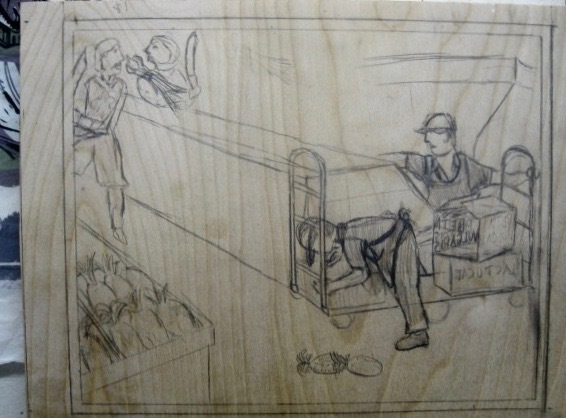 So today I redrew the two figures in the upper left corner. Once again copied from the Tapestry, but larger this time, and I replaced their battle axes with the large curved butcher knives. I'm going try to find a way to use the ancient English flag design in the space in the upper middle, and for now I relocated the flying beets over by the two fighting men. 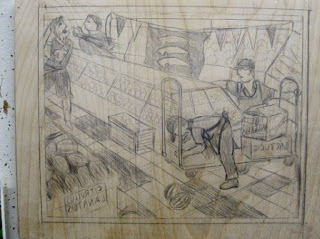 Since I had put a few pineapples on the floor already (my nod to the decapitated heads regularly represented in the Tapestry), I added a display case of pineapples, based on sketches I did in the produce department where this started. Still a long way to go, but I feel like I know how to get there.